French President Emmanuel Macron has condemned anti-Semitic abuse directed at a prominent intellectual by "yellow vest" protesters on Saturday. "These abuses are the absolute negation of what makes France a great nation. We won't tolerate them ", Macron said on Twitter. Alain Finkielkraut was on the fringes of a demonstration in central Paris on Saturday when a group of" yellow vests "insulted him with offensive remarks such as "dirty Zionist" and "France are ours", according to a video broadcast by Yahoo News. "I felt absolute hatred and, unfortunately, this is not the first time," the French writer and philosopher told the Sunday newspaper. Journal du Dimanche. He expressed relief that police intervened. Finkielkraut has expressed his solidarity and sympathy with the "yellow vest" protesters from the outset but in an interview published Saturday in Le Figaro, he criticized the leaders of the movement, saying "arrogance has changed" Comments on ". Saturday's incident triggered a wave of condemnation and messages of support for the philosopher. Interior Minister Christophe Castaner said it was "simply intolerable" while the leader of the Republican opposition party, Laurent Wauquiez, denounced the "abject idiots." Ian Brossat, French Communist Party candidate for the European Parliament, said, "We can hate Finkielkraut's ideas", but "nothing can justify attacking him as a Jew". Finkielkraut, who is seen as having pro-establishment beliefs, has since January 2016 has been a member of the French Academy, the prestigious institution in charge of defining the French language. The "yellow vest" protests began three months ago over fuel taxes but quickly grew into a broader anti-government rebellion fueled by indicating that Macron, with some using anti-Semitic tropes to refer to his forms job as an investment bank. "Conspiracy theo rists are very present among their ranks, " Lecornu said, before referring to a survey released on Monday. The Ifop poll said nearly half of the" yellow vests "believed in a worldwide" Zionist plot " , as well as the "Great Replacement" theory, which positions that immigration is organized deliberately "to replace Europe's native populations". But the rise in anti-Semitic acts in France predates the "yellow vest" demonstrations. A recent spate of anti-Semitic vandalism and graffiti in and around Paris has stoked fresh concerns about an increase in hate crimes against Jews. During the latest episodes, the memorial for Ilan Halimi, a young Jewish man who was kidnapped and killed in 2006 was decapitated when a tree was planted in his memory was chopped down. Around 41,500 protesters nationwide turned out Saturday, some 10,000 less than the previous week, with 5,000 in Paris. 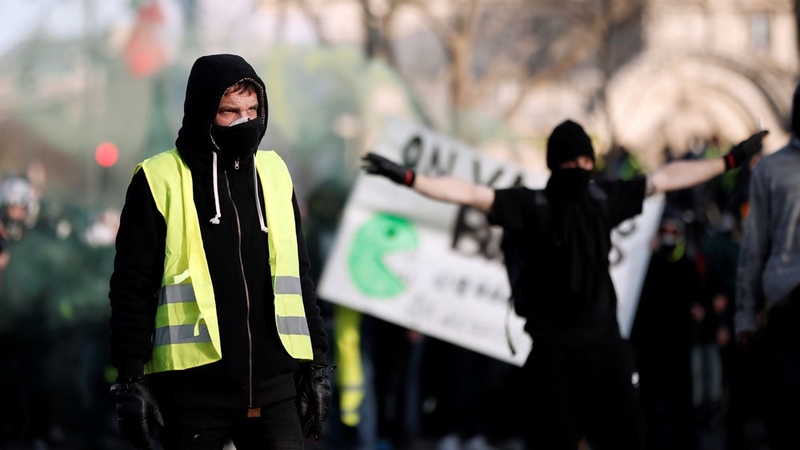 hour-long march ended at Les Invalides, with projectiles thrown at police, by masked individuals dressed in black, a uniform for the ultra-leftist black blocs. Lines of riot police used tear gas and an impressive backup, a special horse brigade and water cannon – apparently not used – to force the agitated crowd to disperse.